Mark your calendar on Sat. 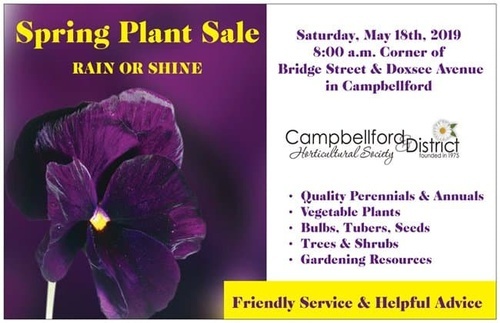 May 18th, 2019 to attend the Campbellford & District Horticultural Society Spring Plant Sale beginning at 8:00 a.m. at the Bank of Montreal corner of Bridge St./Doxsee Ave., Campbellford. A great variety of quality plants at really low prices & share your questions with our knowledgeable members and onsite resources. Visit: https://www.gardenontario.org/go/society-listing/entry/332/and FaceBook.